i Click 'view all' to instantly compare this good deal with offers on other top wine bottle openers. 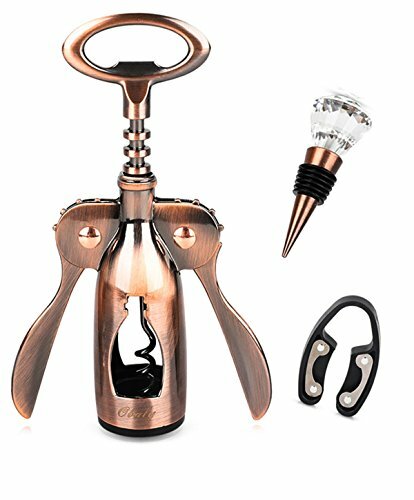 OBALY Wing Corkscrew Wine & Bottle Opener, Bottle Stopper & Foil Cutter is currently selling at $13.95, approximately $0.02 lower than average, giving a potential saving of $0.04 right now. With a lowest price of $13.95 and an average of $13.97 it is selling on the low end of its usual range. Price volatility is 0.59% (meaning it does not change often), so the price should stay low for a while. Right now this product is a recommended 'good deal'. The current deal is also the best price on this item over the last month. Compare the current price, savings (in dollars & percent) and Buy Ratings for the top Wine Bottle Openers that are closely related to OBALY Wing Corkscrew Wine & Bottle Opener, Bottle Stopper & Foil Cutter. Here is how OBALY Wing Corkscrew Wine & Bottle Opener, Bottle Stopper & Foil Cutter compares with other leading Wine Bottle Openers.
? ApplicationsPerfect gift for the wine enthusiast.A great way to break the ice when meeting new friends.Can be used to open bottles of wine and bottles of bee ?Package Content 1 x Wine Bottle Opener 1 xWineBottle Stopper 1 xWine Foil Cutter ? How To Use1.Sit the wine bottle opener over the bottle.2.Twist the turning knob to insert the auger into the cork. (Centered screw point ensures screw drives through the center of the cork, you may also watch through the designed hole in opener and make sure the screw keeps perpendicular to the cork3.Watch opener’s wings rising4.When wings rise to proper height, press both wings down to extract the cork. FeaturesCOMBINING FUNCTION AND STYLE - Classic two arm 'butterfly design' wing corkscrew wine opener. Also functions as a bottle cap opener. Essential accessory for your personal wine collection. The same great as a exquisite gift to the companion's wine lovers.PACKED WITH ACCESSORIES - Beautifully designed, the wine bottle opener corkscrew set is generously accessorized for your optimal convenience. 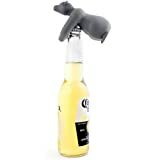 It includes a handy magnetic foil cutter, to easily remove foil and leave a smooth edge and clean bottle top; wine bottle stopper has a soft rubber gasket for a firm fit with crystal decoration of modern appearance design.SATISFACTION GUARANTEED - 100% return guarantee, return within one month of date of purchase and receive your purchase price back; we want you to be thrilled with our high quality wine opener gift setHELPS KEEP CORK PIECES OUT OF YOUR WINE. Smooth lever action helps prevent damage to the cork done by the twisting of traditional corkscrews. Works on natural corks, composite corks, and synthetic corks.